Description: Growing up to about 30 feet, cascara could be considered a small tree or a large shrub. Its leaves are deciduous, simple, and alternating on the stem. They are oblong (2 – 6” long) and prominently penniveined (having a single central leaf vein with singular veins branching to either side). The leaf edges are very finely serrated or wavy. The small, green-white flower clusters are inconspicuous. 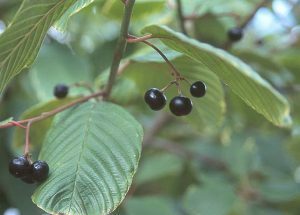 The cherry-like fruits are round, 1/3” diameter, and purple to black with a yellow pulp. In winter, look for smooth, gray-brown bark with a patchy appearance. Winter buds are naked, meaning they appear to be small clusters of tiny overlapping leaves. 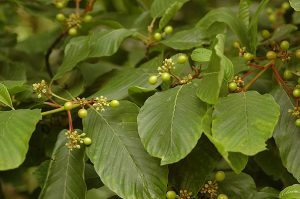 You may have mistaken cascara for red alder, which has similar looking oblong, serrated, prominently-veined leaves, smooth bark and also grows on moist sites. You wouldn’t be the first to confuse these two hardwoods. You can tell cascara and alder apart primarily by the fruits; cascara has a dark purple to black cherry-like fruit while alder has a one-inch woody cone-like fruit (called a strobile). Cascara’s leaves are smoother and glossier than alder’s. Ideal habitat: West of Cascades in low to mid elevation coniferous forests; Grows on moist, well-drained sites, especially along streams; tolerant of shade. Wildlife Value: This plant is particularly attractive to birds. For example, the band-tailed pigeon feeds on cascara fruits from July through autumn, often congregating in cascara patches well into the migration season. Band-tailed pigeons are found along the west coast and prefer nesting habitat less than 1000 feet in elevation, putting them in private forestland throughout much of western Oregon. Cascara is also a preferred forage for elk and valuable for pollinators. Management Considerations: Cascara is not a very fast or aggressively growing species, so it does little to compete with the growth of timber species such as Douglas-fir. Consider retaining existing cascara trees when selectively harvesting in mixed forests. You could also try underplanting cascara in small openings after a thinning. For pollinator or mammal forage, plant in clumps along stand edges to promote flowering and a more thicket-like habit.